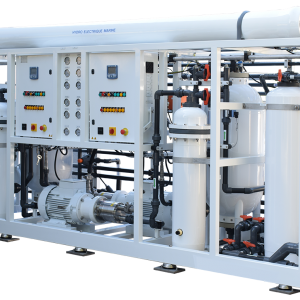 What if you wanted a glass of water one morning and all of the water was gone? What would you do? Our water is our most important natural resource and it’s steadily being used up. That means it’s really possible to wake up one morning and not have any water to drink. So why not start water conservation? Not only will this affect you and your family, but it’ll also affect animals, plants and our whole planet. Educating yourself about water conservation is the first step before doing any actions. It’s important that we take care of our resources so that our families will always have clean, safe drinking water. First, let’s understand what water conservation really means. Water conservation means doing as much as we can to not waste water when we use it. Only 1% of the water on our planet is safe to drink while the rest is salt water. That means we need to conserve as much as possible by getting into good water-using habits every day. We can live up to two weeks without food but only days without water. Plants and animals all need water to stay healthy and grow. If we use up all of our safe water supply, we may cause our ecosystem to become unbalanced. Think about fish in a lake near your house, many houses get their water from local lakes and reservoirs. These bodies of water provide a home to wildlife like fish and other animals, like deer, depend on what water to drink. If you always leave the water on when you brush your teeth or rinse dishes or over-water the lawn, eventually, you’ll use up that resource, leaving these animals without their homes or drinkable water. If they can’t find water somewhere else, they may become very sick. this can create big problems for us in the future, since our whole world depends on these ecosystems to keep the natural cycle of life stable. In addition, when you use less water, your household won’t spend much on water bill, saving you money for other utility bills. The great thing about water conservation is that it’s super easy! Below are the natural, home-remedy ways to help you conserve water. 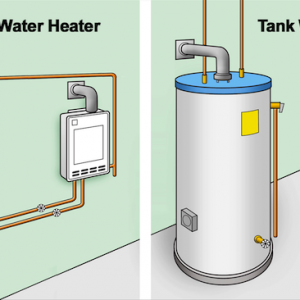 Note that for a larger-scale, eco-friendly home remodeling services, Talon Plumbing can help your family make the best choices to conserve and recycle water and any time and any cost you want. Just by turning off the tap while you brush your teeth in the morning and before bedtime, you can save up to 8 gallons of water! That adds up to more than 200 gallons a month, enough to fill a huge fish tank that holds 6 small sharks. The same is true when you wash dishes. Turn off the tap! Scrape your dirty dishes into the trash – then put them in the dishwasher. Taking a shower uses much less water that filling up a bathtub. A shower only uses 10 to 25 gallons, while a bath takes up to 70 gallons. 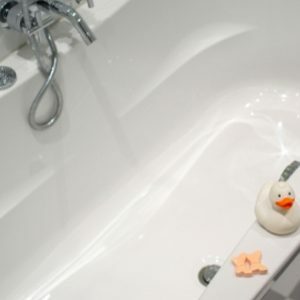 If you do take a bath, be sure to plug the drain right away and adjust the temperature as you fill the tub. To save even more water, keep your shower under five minutes long – try timing yourself with a clock next time you hop in. Fixing a toilet leak is a great way to reduce household water use and boost water conservation. If your toilet has a leak, you could be wasting about 200 gallons of water every day. That would be like flushing your toilet more that 50 times for no reason! Try this experiment: ask your parents to help you test for leaks by placing a drop of food coloring in the toilet tank. If the color shows up in the bowl without flushing, you have a leak. Watering your yard first thing in the morning is a great first step to water-efficient landscaping. Avoid watering your yard in the middle of the day. Watering when it’s hot and sunny is wasteful because most of the water evaporates before the plants have time to drink it. Also, when you’re helping your parents water the yard, make sure not to water the plants too much – remember that a little sprinkle goes a long way. An easy way to save water is to use a bucket and sponge when washing cars and bikes. Washing your bike or car with a bucket and sponge instead of a hose saves a lot of water. A hose can waste 6 gallons per minute if you leave it running, but using a bucket and sponge only uses a few gallons. Also, some car washes recycle water instead of letting it run down the sewer drains. Ask your parents to check if a car wash near you recycles water. 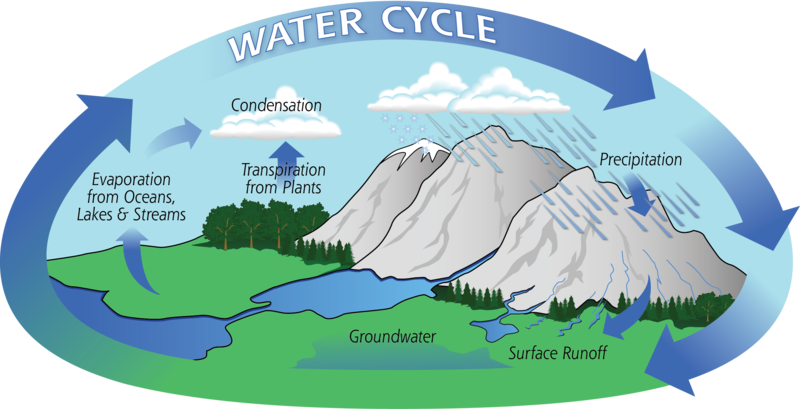 The water cycle is nature’s way of recycling water to be used and reused again and again. It starts when the sun shines on the ocean or other bodies of water. The water heats up and becomes water vapor in a process called evaporation. Water vapor is a gas, much lighter than liquid water, so it floats up into the atmosphere, where it becomes clouds. Clouds are very light, so when the wind blows them, they get moved around, either over farm lands or forests, or even in your neighborhood. As clouds grow, the water vapor begins to get colder again and eventually, it falls to the ground as rain or snow, both of which are forms of precipitation. The water soaks into the earth and is sucked up by plants or falls into reservoirs and is used by us to clean, bathe, drink and cook with. The water that isn’t absorbed or used finds its way back into oceans, rivers and lakes and stays there until the sun warms it again and it evaporates back up into the atmosphere. The first step to water conservation is education, knowing how and when to save water at home or anywhere. Utilize these resources to understand more about what you can do to conserve water, starting at home.